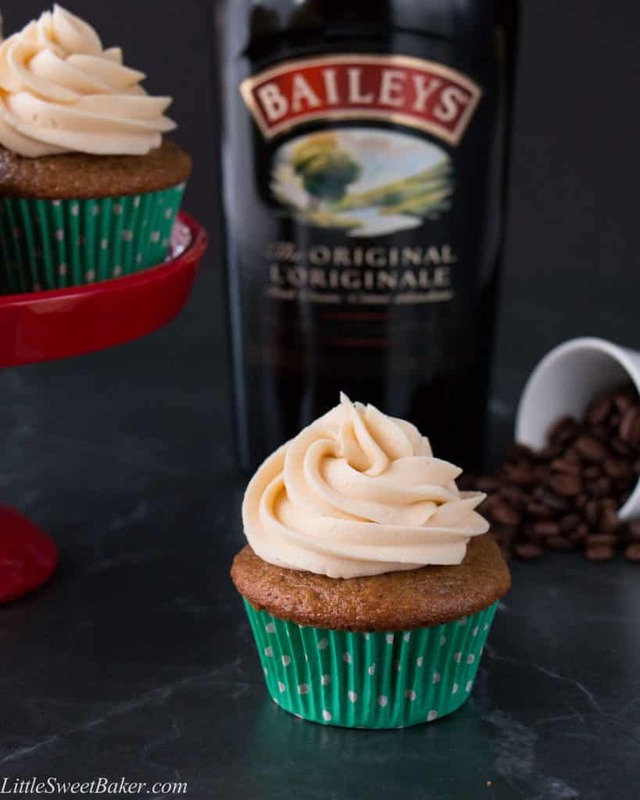 These soft and fluffy cupcakes are enriched with a lovely coffee taste and spiked with an Irish cream whiskey buttercream. 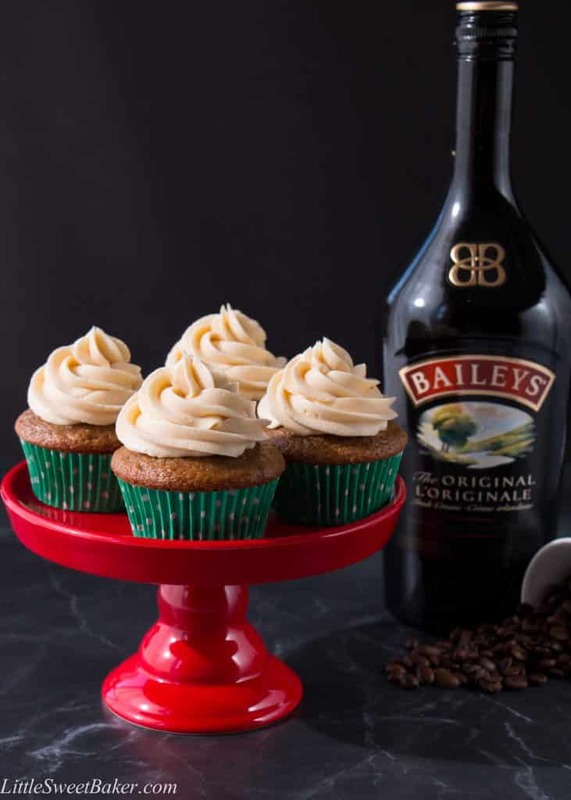 They have all the flavors of an Irish coffee in a cupcake form. My husband and I will often enjoy an Irish coffee made with Baileys Irish Cream liqueur on a weekend morning or after a special dinner. It’s got cream and sugar already in it, so it’s kind of like making a regular coffee, but so much better. The Baileys adds a delightful chocolate and vanilla taste to the coffee. There’s also a warm and comforting aroma of peppery floral notes from the whiskey. In celebration of St. Patrick’s Day coming up, I decided to create an adult cupcake version of this popular drink. 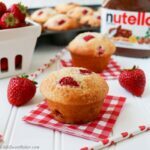 The recipe starts with a light and moist cupcake infused with an intense coffee flavor. 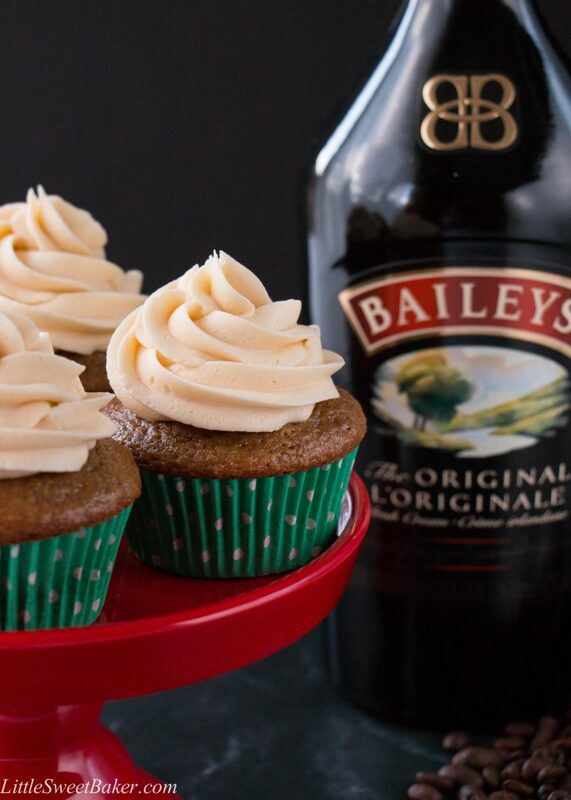 Then it’s topped with a rich and buttery Irish cream whiskey frosting. 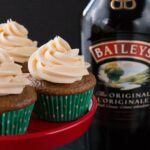 These soft and fluffy cupcakes are enriched with a lovely coffee taste and spiked with an Irish cream whiskey buttercream. Preheat oven to 350F and line 2 muffin pans with 14 paper liners. In a large bowl, mix together the vegetable oil and sugar with an electric mixer. In a small bowl, dissolve the instant coffee in the warm water. Add to the wet mixture along with the sour cream. Mix until blended. Add in the flour, baking powder, baking soda, and salt. Stir on low speed until just combined. The batter won’t be super thick. Divide the batter amongst the 14 paper liners. Bake for 15-18 minutes or until a toothpick inserted into the center comes out clean. Let cool completely before frosting. Beat the butter until light and fluffy. Mix in 1 cup of powdered sugar, then mix in the Baileys. Add in the rest of the powdered sugar, one cup at a time, mix until blended. Frost as desired. I used a Wilton 1M tip to apply my frosting. Recipe adapted from Cookie Dough and Oven Mitt. 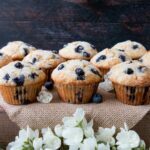 I’ll be sharing this at Fiesta Friday #161 hosted by Angie and co-hosted by Laura@FeastWisely.